This week’s Kids Who Kare group will be in keeping with our October theme: continuing our bond with our departed loved one, expressed in small group sharing, and creating a Dia de los Muertos “altar” to honor that special person. Witnessing this process during our last group was inspiring. In our small group discussions, each little face lit up when sharing something about their loved one…it helped other group participants come to know each other’s special person by name, and to hear something interesting or meaningful about their life. It was truly delightful to witness how engaged the children were with creating their altars at the art table. We will continue this process, to allow each child the chance to slow down and really engage in this sacred ritual. We will complete our altars with candles, flowers, a few special sweet treats, and a joyful celebration. Kids Who Kare has, in the past, celebrated in the Dia de los Muertos tradition around Halloween, and coming on board to the program this year, I’ve enjoyed learning the many fundamental differences between the two holidays. Though it is easy for many Americans to confuse Dia de los Muertos as being a Mexican Halloween, it is rather, a very beautiful and joyful tradition steeped in history as a time to remember and pay tribute to our departed loved ones. I see it as a holiday of love, rather than of fear…..the focus being a celebration of life, rather than the fear of death. Many families observe the holiday with vibrant rituals of decorating sugar skulls, and making altars for loved ones with offerings of food,drinks, flowers, candles, colorful banners, photos or other objects. The purpose of the altars is not one of worship, but rather, of communicating love, remembrance, and connection. Though we often see the calavera (or skull in Spanish) as the wellknown symbol of Day of the Dead, its purpose is more about mocking death rather than scaring folks. There is oftentimes music, dance, and stories to commemorate the departed; many people use it as a time to complete any unspoken communication with loved ones, which is an important piece of healing, at any age. What I love about this tradition is that it allows us to not only connect in symbolic ways with our deceased, but it allows us to connect in present time with our surviving family members, which helps us feel supported. So, when your child takes their altar home, may you enjoy connecting with each other as a family in sharing meaningful memories, and supporting each other as you walk this path of healing. For this final year at Old Settlers Park, a generous Tree Grove sponsor is donating TWO trees to help families honor their loved ones. LEAVE A COMMENT on THIS blog post, telling us how a memorial tree would help you and your family remember your loved one. LIKE us on Facebook, and comment, or post to our wall. We will pick two winners in a RANDOM DRAWING on Thursday, August 14th. The Dedication ceremony for the Tree Grove will be held Saturday, October 25th. The 2013 Memorial Tree Grove Dedication will be on Saturday, October 19th, at 10am at Old Settler’s Park in Round Rock. More than 100 attendees from 30 families will be dedicating a tree to their loved one, and your business can be a part of this special event by sponsoring the ceremony. Audience: Over 100 people representing 30 families who are honoring loved ones by planting a Memorial Tree in their name. For more information, please contact Cara Fox or call The Christi Center at 512-467-2600. It takes a village to survive loss of a child. Unfortunately, I know. Dylan, my son, my only child, the light of my life, died in a car accident at the gate of his apartment complex on May 22, 2006. Dylan is forever 19 years old. My life became two parts – before May 22, 2006, and after May 22, 2006. I can’t even think about the actual day. I also can’t believe that it has been seven years since I saw Dylan, and this is Village #7. This year Dylan Day was a trip to New York City with my friend Billie, who I know from the Christi Center. The Christi Center is a grief-support organization in Austin. The trip nearly ended the first day because my blood sugar got so low at the restaurant that I started jerking. Even though Billie had seen me with low blood sugar many times, she didn’t realize that jerking was a sign of very low blood sugar. I ate a peep and I guess the sweat stopped pouring down my nose. Billie got them to pack up the food and we took it to the hotel to eat it. We did all of the New York things – the Empire State Building, the 911 Memorial, Central Park, Times Square, and Harlem. We ate at Carmines in the Broadway District – that was Julie and KK’s Angel Joseph’s favorite restaurant so we ate there with pictures of Dylan and Joseph on the table. We spent a lot of time on Long Island, and even went to the beach there. At Tiffany’s in New York, I got a letter “D” to go on Dylan’s charm bracelet. The main reason for the New York trip was to meet with the medium George Anderson on May 22. George’s book “Walking in the Garden of the Souls” was a comfort to me after Dylan’s death, and I have read it several times. When I saw that George had openings on May 22, there was no doubt in my mind that I should go there. I imagine a lot of people who read this will say that he’s the devil, but I don’t care if anyone thinks that or not. As a mother who can’t talk to her child anymore, I consider George a comfort, a help, and an angel. Some of the things George said were “Just answer yes or no so they can hear your voice,” Don’t correct me if I’m wrong,” and “Just answer yes or no” over and over again. Many times Dylan said, “Just go back to the beginning and start over again,” and “I’ve had you up to here.” Much more comforting information was obtained from Dylan, but that’s all I’m saying here. I wore the 2012 Dylan Day shirt in New York. This one said “The Last Fandango, 25 years.” That was a sign since Dylan would have been 25 in 2012! The back of the shirt said “Everything passes, everything changes, just do what you think you should do.” Sounds just like my life. In June, I went to College Station to meet with the police reconstructionist who went to the scene of Dylan’s accident. I can’t remember what prompted me to do that, but I just felt the need to do it. Two Christi friends, Billie and Dorcas, went with me. Dorcas was my driver and Billie was my handler. We also met with the Victim Services person. I don’t know what the hell I had been thinking for six years – I guess I just thought Dylan had a little wreck and happened to die. I had no idea how bad the wreck was! There was no way I could have looked at those accident pictures or discussed the accident even last year. I’m glad I know the information now – I feel like it is my responsibility as Dylan’s mother to know all of the information. I just had no idea how bad the wreck was – the damage the truck did to the gate, and the damage done to Dylan’s truck. I just had no idea! I saw pictures of Dylan’s truck, pictures of the gate, pictures of the accident scene, pictures of everything but Dylan. They told me how they figured out what happened – from the tires on the truck to the size of the truck to the skid marks. They had computer-printed drawings of how the accident happened that were based on the accident information that was entered on the computer. When we left the police station, I told Dorcas I needed a drink. Dorcas asked if I wanted her to go through McDonalds. I said no I wanted alcohol, so we went to Chili’s. Four double bourbons and diet cokes later, we were on the road again. I WASN’T DRIVING. Dorcas was and she hadn’t drunk like a fish like me. We got into a huge rain storm and stopped at a gas station, and I had two beers. If I called you drunk that night, I’m sorry. I guess I was in shock all over again. Thanks to Billie and Dorcas for escorting me on that fact finding, yet emotional trip. We put 13 roses at the gate where the accident happened when we left town. My good friend Diane drove her daughter Hilary to College Station last summer. I picked Diane up in College Station, and we saw where Hilary was going to live. Before Diane and I left College Station, we took 13 roses to the gate where Dylan died. Diane stayed with me Tuesday through Friday. I can’t remember what all we did – but I know we had a good time, and we laughed a lot. Although Diane and I don’t get to spend much time together anymore, when we are together it’s just like we’ve never been apart. Guess that’s a sign of good friends! I do remember we took Dewey and Dutchess walking on the Barton Springs greenbelt and sat on Jessie’s bench, and we nearly died of a heat stroke. And she added many applications to my I Phone, including Words with Friends. Although I have played hundreds of games, I have only won five. I hope to break that record by the next village. Brother David invited me back to his condo in Blue Mountain Beach, Florida. This year cousins Bonnie, Lynn, and Peggy came too. We had a blast, and David was an excellent host. We had good food and good drinks. Peggy and Bonnie even made us hot water cornbread for breakfast. It was so good, we had it the next day too. Hot water cornbread is part of our childhood. Tuna dip is big in Blue Mountain Beach and it is very good. Some of David’s friends came over one night, and they brought their two-month old baby named Dylan. It was a comfort to hear the name Dylan. This year I went to Las Vegas three times. I know it sounds like I’m a gambler, but I’m not. In October my Christi friend Nancy and I went to Vegas and we saw Elton John and Garth Brooks perform – separately of course. Both concerts were fabulous! In February I went with a friend. On Dylan’s birthday, February 12, I jumped from the 108th floor of the Stratosphere Hotel. That was scarier than sky diving! I know you should never say never, but I’ll never do that again. Friends Topsy and Bob witnessed the jump too. On that trip we saw Donnie and Marie Osmond perform. I was touched when Marie dedicated an opera song to her son Michael, who died in 2010. That connection with parents who have lost children is with us everywhere we go. In April I went with a friend and we saw Cirque de Soleil Beatles Love. That was an incredible show. Good thing I don’t have to choose a favorite show out of those because I couldn’t. Seven friends lost parents this year (Cindy, Phyllis, Deana, Danni, Debbie, Erik and Sandi). It seems so weird to me that people my age still have parents living since Momma died 38 years ago and Daddy died six years ago. If you lost a parent and I forgot to mention you, please forgive me. And I have many more friends at the Christi Center who this time last year still were living happy lives with all of their kids. Please keep them in your thoughts because the early years without your child are the worst of the worst. Before this year, I had only gone to one wedding since Dylan died. This year I went to five – Morgan, Whitney, Lindsay, Brandalynn, and Brody. On the program of Lindsay and Rob’s wedding, Dylan was listed in the In Loving Memory Section as Bride’s Longtime Family Friend. That was a complete surprise to me, and I was touched that they remembered Dylan. At Brody and Ashley’s wedding, Brody surprised his mother and escorted her down the aisle. That touched my heart and I know Dylan was proud of Brody for doing that. I saw a lot of boys that went to school with Dylan. It was good to see them – not depressing like I thought it would be. It was just weird that those boys are grown up now and Dylan is still 19. It seems like I didn’t have as many firsts this year. I went to the first Lake Travis baseball game that I have been too since Dylan died. I saw some people that I knew, but I didn’t speak to them. Just didn’t feel like having people feeling sorry for me, so I stayed out of their view. I went to a football game at Texas A&M. We didn’t go to see the Aggies. We went to see LSU and LSU won – thankfully. Gary, Dorcas, Billie, and I had to catch the LSU alumni bus at 6:00 a.m. By 9:00 a.m. I had drunk two shots of bourbon, had two beers, and had a Bloody Mary. It’s hard to get back into the LSU football atmosphere when you’ve been out of it for 34 years! I just can’t figure out why those Aggies stand up the entire game. That was too hard on this old person! Also this year, I went to several slumber parties. Julie and KK have me regularly – I guess they just like me. This year I had a knee manipulation because my right knee never had enough flexibility after my knee replacement. Thanks to Dr. Carter and my physical therapist Kim, my right knee is almost as good as my left knee now. I went to another Mom’s retreat at Charlie’s Place, went to another Young Life banquet, continue to volunteer at the Christi Center, continue to work part time with the nicest people, and continue to take care of my babies Dewey and Dutchess. I got two more tattoos for Dylan this year – another heart for his birthday and the word believe in Dylan’s own handwriting because I believe I will see him again. David I know you are counting – that’s nine now. Dylan’s Young Life fund has raised over $45,000, which will help send many Lake Travis kids to Young Life camp. Erin, a good friend of Dylan’s, surprised me with a charcoal drawing of Dylan. Erin’s aunt drew the picture. To receive it right before Mother’s day was a special treat. Those of us who have lost a child realize how special these gifts are! Dylan continues to constantly be in my heart, my thoughts, and my mind. He is still the center of my life. However, seven years down the road the happy memories are easier to remember. One day I was putting on a shirt and the tag rubbed my neck and I smiled – because I remembered that Dylan always cut the tags off his clothes – he couldn’t stand them touching his body. It doesn’t seem like much of a memory, but it is. This year I started seeing a counselor again and am attending church regularly now. This is the first time since Dylan died that I enjoy going to church. With all I’ve done, I still haven’t found that purpose that I’ve been looking for. It’s looking more and more like my sole purpose was to be Dylan’s mom. Read Marianne’s annual reflections beginning with “It Takes a Village,“ written less than a year after the death of Marianne’s son, Dylan. Marianne has generously shared her journey with us. Her subsequent annual updates are, “The Village Minus Two,” “The Village Retires,” “Dutch and Dutchess,” “Minus Old Knees” and “The Bible”. It takes a village to survive loss of a child. Unfortunately, I know. Dylan, my son, my only child, the light of my life, died in a car accident at the gate of his apartment complex on May 22, 2006. Dylan is forever 19 years old. My life became two parts – before May 22, 2006, and after May 22, 2006. I can’t even think about the actual day. I also can’t believe that it has been six years since I saw Dylan, and this is Village #6. This year Dylan Day was more than one day. It was a road trip to Blue Mountain Beach, Florida – by way of New Orleans. My Christi friends Nancy, Deana, me, and our Angels Dylan, Hayley, and Johnny headed toward the Mississippi River while the rest of the world was running from it because it was flooding in three states – Tennessee, Mississippi, and Louisiana. Deana and Nancy had never been to New Orleans, so it was fun showing them Bourbon Street, Jackson Square, and all the good food and drinks. We went to Pat O’Briens, Felix’s Oyster Bar, Café Du Monde, and had Muffuletta sandwiches from Central Grocery. And Nancy went with me to talk to a psychic/medium named Joseph. Joseph is the fourth psychic who has said I’m going to live into my 90s, so I’m beginning to think that it might be true. If so, I hope my knee replacements last that long! I took good care of my cell phone in New Orleans, and then dropped the damn thing into a cup of water while riding to Florida. One of the Angels in the car must have said open it and get my brother David’s number because I did that. After that, the phone was dead. I called David on Nancy’s phone, and he gave us the directions to his condo and how to get into the gate. I don’t know what would have happened to us if I hadn’t been able to get his number off the phone because I had no clue what his number was and he didn’t have Nancy or Deana’s numbers either. That night, David cooked shrimp for us that were very good. I thought David was going to be with us the entire time, but he left early the next morning so I was disappointed I really didn’t get to spend any time with him. It seems like every time I see David we are rushed – except when Dylan died. David came immediately and stayed a week with me. David took care of everything, and he took care of me, and I’ll always be grateful to him for that. Nancy and Deana thought the white sandy beaches, blue water, and the condo were beautiful. We spent a lot of time walking up and down the beach, playing in the water, and drinking. Thanks to Nancy’s Nano, we even had music at the beach. We had umbrellas and chairs and boogie boards and all the beach toys. We had it all – except for the most important people – Dylan, Hayley, and Johnny! All we could do was write their names in hearts in the sand. On May 22 we wore Dylan tee-shirts. The shirts were really made for Dylan Day (Bob Dylan) at Westlake High School, but it’s spelled like Dylan so what the hell. The quote on the back of the shirt said “May you build a ladder to the stars and climb on every rung.” The shirts were great! This year, Christi friend Billie and I went to College Station to support some Christi friends whose daughter Lindsay was killed in the Northgate parking garage. While in College Station, I took flowers to the gate of Melrose Apartments, where Dylan died. I even made pictures of the gate this time. And I also requested Dylan’s autopsy. I haven’t looked at it yet, but my friend Billie read it. I don’t know if I’ll ever read it, but I have it in case I want to. Quite a few people that I knew died this year, including Paul Patton, who graduated from high school with me, and Cindy Bolling, who was born the same day in the same small hospital that I was born in. I was small and unhealthy, and my family would look in the hospital nursery and wish I was as healthy as Cindy. Now, for some reason Cindy is dead and I’m still here. Several cousins (Lynn and Peggy) and a good friend (Diane) lost their fathers this year. At one funeral I attended, an old friend asked me “What’s Dylan up to these days?” Six years ago that question would have thrown me into a tailspin, but this time I told him that Dylan died in 2006. I don’t know what you call my different reaction – progress? Progress doesn’t seem like the correct word, but I don’t know what the correct word is. The constant raw grief of Dylan’s death is gone most of the time. I think that’s my body’s way of protecting me. You can’t survive in that state for very long. At the same time, I’m meeting many new mothers at the Christi Center – new in their grief and life without their children. Seeing them makes me realize how different I am now than I was six years ago. But many of these women have become good friends of mine because loss of a child is a tie that binds. If you read last year’s village, you know I said I was going to read the entire Bible. Well I did it! I spent Dylan’s birthday (really six days and four nights) at Lebh Shomea, House of Prayer, to read the Bible. This was my second trip there. I think there was a priest reunion going on when I got there, but it’s hard to know for sure since Lebh Shomea is completely silent, except for Celebration of the Eucharist each day, and the Sunday lunch meal. All I know is they were talking in another language at the end of the Eucharist. I was behind in my Bible reading before I went to Lebh Shomea. My friend Pam said I should get the Bible on CD to listen to for the five-hour drive to Lebh Shomea. Well I got it, but it was quite a few CDs – 63. So I listened all the way down there and back, and I read the Bible the whole time I was at Lebh Shomea. I listened to the Bible driving back and forth to work. I finished the Bible in April. I didn’t understand a lot of it, but at least I can say that I read it. No trumpets sounded when I finished it. I just put it down. I talked to Father Kelley while at Lebh Shomea and I told him I didn’t understand a lot of the Bible. He said the Bible is very figurative, and I am a very literal person. Father Kelley said God is love, God is mystery, and Dylan loves me. That’s a lot easier to understand than trying to understand the Bible. I had many more firsts this year. I planted mustard seeds because my cousin Raymond said all you have to do is throw the seeds out and they grow. And they did. The mustard greens grew like crazy. I even blanched some and put three bags in the freezer. I always thought Aunt Dot would be here and she would just give me frozen greens to take home. But she’s not here anymore. I hope PawPaw, Dot, Bill and all the other farmers in the Barnette/McDonald families were proud of my mustard greens. I learned Zumba (thanks Hazel) and Yoga (thanks Sat), painted the outside trim of my house (with Mark’s help), donated blood and signed up for the bone marrow registry, scanned a picture (that’s right – I’d never done that before), found out what Gobstoppers were, got a rock that says “Dylan Graves – Good to Go” in the Christi Center healing garden, decorated a tree on Loop 360 with other Christi Moms, went to a spiritual grief retreat in San Antonio, and read the entire Bible. I know I already said that I read the Bible, but since it was a first for me, I’m listing it here too. The Dylan Graves Young Life Camp Fund continues to grow and send Lake Travis kids to Young Life Camp. Dylan sent three boys to camp last year. This year I (not really me but new Christi friends Julie and Ken Kirk – thanks Julie and KK) made a card about Dylan and Young Life. Julie told me that she made a card for her Angel Joseph and it was real easy. Well, after the Apple Help Line knew all about Dylan and Joseph, and many hours of work, we got the card finished. If you haven’t received one and you want to know what it looks like, mail me a check to the Dylan Graves Young Life Camp Fund and I’ll send you a thank you note on the card. Several months ago while cleaning out my closet I discovered a box that had down feathers in it. I knew right away that those feathers were part of the two down pillows that my dogs Dutch and Dewey tore up during Dylan’s funeral. Looking in the box, I found two notes that Dylan had written during the last month of his life. They weren’t anything significant – just notes about messages on the answering machine. But they were to me and they were in Dylan’s print, so they were very important to me. I continue to do many things. I got another tattoo for Dylan (seven now), went to another Young Life banquet, went to another luncheon at Christmas with Christi Moms, went to another Moms retreat at Charlie’s Place, continue to volunteer at the Christi Center, continue to work part time, and continue to take care of my babies Dewey and Dutchess. I reconnected with my Dad’s relatives in January. It’s the first time that I’ve seen many of them since my Dad died five years ago. I’m glad I went to the McDonald gathering and hope I can go for many more years. Most of my village from six years ago is still here, and I’m glad they are. But it seems that I don’t constantly need the village as much to survive. I talked about this with my good Christi friend Nancy. Nancy and I walked in the Christi Center at the same time six years ago. Her daughter Hayley and Dylan died one week apart, and their birthdays are one week apart (but Hayley is one year older). Nancy and I have been together step by step in this journey. I have seen her change and she has seen me change. Now, the good memories of Dylan shine brighter than his loss. I still miss Dylan with all my heart and think about him every day, but I think I finally realize that he’s not coming back, and I can’t change that. I don’t ask “why” all the time like I did at first. And like I’ve said before, Dylan would be pissed if I wasn’t able to enjoy life because of his death. I still haven’t found my purpose, so hopefully I’ll find it by the next village. In the meantime, I’ll continue to try to make Dylan proud. It takes a village to survive loss of a child. Unfortunately, I know. Dylan, my son, my only child, the light of my life, died in a car accident at the gate of his apartment complex on May 22, 2006. Dylan is forever 19 years old. My life became two parts – before May 22, 2006, and after May 22, 2006. I can’t even think about the actual day. I also can’t believe that it has been five years, and this is Village #5. The year began with tubing on the Guadalupe River in New Braunfels on May 22, 2010. This is the third trip to celebrate Dylan’s life. Anyone who knew Dylan knows he would rather have us do something fun to remember him – instead of being sad. We rented a house for two nights again, but this house was on the Guadalupe River so we could sit in the river or by the river whenever we wanted. Eleven of us tubed – Dylan’s friends and my friends. I have to say the water was the roughest this year. Pam had fixed muffaletta sandwiches for us, and at Nancy’s request, Pam made some kind of trash mix (not really trash) that was a big hit last year. We had the food in the ice chest for about two minutes. We went over the first waterfall, and the food was gone, and so was Pam. Pam didn’t drown, but she got out of the river and swore she would never tube again. The water was so rough we couldn’t stay together like we had the previous two years. One of our tubers lost two false teeth in the river, and the rest of us got banged up. I’m sure Dylan was laughing at us the entire day. This year we wore Dylan Day tee-shirts. Nancy’s nephew goes to Westlake High School, so he got us the shirts. The shirts were really made for Dylan Day (Bob Dylan) at the high school, but it’s spelled like Dylan so what the hell. The quote on the back of the shirt says “I’ll let you in my dreams if I can be in yours.” The shirts were great! Four other For the Love of Christi (FLOC) friends came to eat with us that night. We enjoyed a lot of good food, good drinks, and good memories of Dylan. Dylan’s first real girlfriend, Joannah, was on the trip and she shared some Dylan memories that I hadn’t heard. Before leaving New Braunfels, Nancy, Deana, and I went to eat at the Gristmill. We all had chicken fried steak for Dylan. And his vegetable of choice – French fried potatoes or mashed potatoes. Elizabeth, a friend from FLOC, had a dream about Dylan. In the dream, she was planning a camping trip with me, Deana, and Dylan. She said we were talking about the food we were going to eat, and she said Dylan was laughing and smiling and was so excited about the camping trip. Elizabeth has never met Dylan, and only knows about him from FLOC. The day she told me about the dream, I had on my Dylan Day tee-shirt. I turned around and showed her the back – “I’ll let you in my dreams if I can be in yours.” We were both crying by the time she finished telling me about her dream. On my birthday, the Young Life kids left for camp. Dylan’s fund sent two boys from Burnet, Texas. I know one of them, Joe. He’s the first person that I know personally that has gone to camp using Dylan’s fund. It was emotional being at the bus watching all of the kids being dropped off by their parents – remembering the two times that I had taken Dylan to catch the bus to Young Life camp. It was also hot as hell that day! Joe called me the day he returned from camp and told me what an awesome and meaningful time he and Richard had at camp. Joe and Richard, and all of the Young Life staff, know that Dylan’s fund sent them to camp, so Dylan is still touching lives. My good friends from Chicago, Diane and Steve, came to New Braunfels to see their daughter Hilary. I stayed with them for three days and three nights, and we had a great time. Diane has been my good friend for as long as I can remember – I think I was in the third grade and she was in the second grade when we became good friends. My Dad and her Mom were PTA officers at Cherokee Park Elementary School. We went through elementary, junior high, high school, and college together, our marriages, the birth of Dylan and her five children, and my divorce. But more important, we have been through deaths together – my mother, her mother, Dylan, and my dad. After being in New Braunfels with them, I know Diane’s memory is a hell of a lot better than mine – she remembered things I had totally forgotten about. I met my cousins Bonnie and Brooke at David’s condo in Blue Mountain, Florida. It was my first trip to his condo and I hope it won’t be the last. The condo is beautiful, right on the beach, overlooking the beach and the swimming pool. There’s nothing as relaxing as sitting on those white beaches and watching the waves come in! When I was trying to catch fish by hand, they figured out my blood sugar was low and got me to shore. It was truly a wonderful time and David was an excellent host. I was introduced to a new drink – the Drunk Pineapple. The biggest thing that happened this year was that I had total knee replacement on both of my knees in November. I was in the hospital for four days and in a rehabilitation facility for 13 days. I must have been crazy, plum out of my mind because I thought I was going to read books and write in my journal. You would not believe how many books I took – and I didn’t even open one. The surgery was more painful and much harder than I imagined it would be! In four hours I went from being totally independent to being hooked to five machines and incapable of doing anything myself. All five machines had to be plugged in to an electrical outlet – I felt like a stereo system! Since I was given the Carter Cocktail during surgery, my legs were numb and I wasn’t in pain when I woke up. But when the cocktail wore off, the pain began. My friend Billie drove me to the hospital at 4:30 am the morning of surgery, and visited me in the hospital many times. She also visited Dewey and Dutchess at home many times. My friend Joanne was also at the hospital the day of my surgery, although she had to leave before the surgery was over. My neighbor Michelle, who told me about Dr. Carter’s surgical skills, is a nurse in the operating room. She was in the operating room for my surgery, and she gave Billie and Joanne reports during the surgery. In her spare time, she re-circulated blood that I lost during the operation back into my body. Thank goodness Billie was there when the surgery was over and Dr. Carter called for the McDonald family. It would have been awful if no one was there for notification that I survived. After I was released from the rehabilitation hospital, I went to physical therapy three times a week until the middle of March. Many friends visited me, drove me to physical therapy, and brought me food (and drinks) in the hospital and at home. The village came through again! I cried more during my recovery than I have since Dylan died. I think it’s because that’s the first time I was forced to stop and be still since Dylan died, and I couldn’t run from his loss any longer. Dutchess and Dewey were my constant companions while I was home recovering. A new friend, Sandi, cared for them while I was in the hospital and rehabilitation, and continued to walk them until March. Dutchess and Dewey love Sandi, and I will be forever grateful to the care she provided my precious dogs. For Dylan’s birthday, my FLOC friends had happy hour to celebrate Dylan’s, Hayley’s, and Dee Ann’s birthdays. On February 12, Dylan’s actual birth date, Billie and I went to a University of Texas men’s basketball game, then went to eat at Texas Roadhouse. I chose Texas Roadhouse because Dylan and I ate several times at the one in College Station. As usual, I ate Dylan’s favorites – chicken fried steak, French fries, and mashed potatoes. The next day, Susan and Don took me to Pecan Street Café – I ate chicken parmesan, another one of Dylan’s favorites. I received many nice cards and emails. I was especially touched by the emails I received from Young Life parents and counselors. None of them had known Dylan, but they are still impacted by his story. Young Life also sent me a beautiful plant. A friend of Dylan’s, Erin, heard “Good to Go” on the radio. Some things that happened this year for the first time included dancing at Gruene Hall, participating in a panel presentation on grief at the University of Texas School of Social Work, being in a magazine article with other FLOC women with tattoos, and enjoying a visit with my cousin Raymond and my friend Eric – who finally got to Austin to see me. Raymond still can’t believe that our family forgot to tell him they were coming to Austin for Dylan’s funeral. But he and Eric got to see all my Dylan items when they visited. I went to another FLOC Mothers Retreat at Charlie’s Place, owned by Dave and Lou and built in memory of their son Charlie. Twenty-six women attended. It’s still hard for me to believe that I know so many people whose children aren’t on Earth anymore. I consider them some of my closest friends. I still volunteer and facilitate meetings at FLOC. And I got another tattoo for Dylan – I’m up to six now. David – don’t have a heart attack! I still need you in my village. Two things touched my heart this year. Walking in the hall at work, a lady I didn’t know stopped me and said that she sees Dylan’s picture in the paper every year. She said she can see the light in his eye, and she can tell what a special person he was. She said she sees me all the time, but has never had the courage to talk to me. I was glad she told me about seeing Dylan’s picture because Dylan’s memory lives on. The other thing happened at lunch. My friends from work took me to lunch because I got my 30-year certificate. Denise made my picture with her cell phone. There was a heart-shaped white light in the picture with me! I know that was Dylan, and I’m not surprised he made an appearance at a work event. As I’ve said before, my bosses and coworkers have been with me every step of the way these last five years, and remain a big part of the village. I think Dylan was thanking them for being here for me. A good friend, Tommy, died this year. I hadn’t seen him in a while, and I feel bad that I hadn’t contacted him. So I’ve learned – make an extra effort to keep your friends close. Tommy was a big help to me when I first went to FLOC. He always wanted to hear stories about Dylan. Tommy and Dylan both loved baseball, so I’m sure Tommy and Dylan have met and discussed baseball. I hope they talk about me in their conversations. I know for sure that Tommy and Dylan are thanking God that I finally found a version of the Bible that I can understand – “The Message.” A FLOC friend told me about that version. My plan is to read it this year. Hopefully I will have more answers and a greater understanding of my purpose when the next Village comes around. Here at The Christi Center many of us refer to the day our loved one died as an “Angel Day”. Well, today is my Pa Schnack’s Angel Day. He died on April 1, 1981. My mom said that when her brother called to tell her, she yelled at him for trying to play a bad April Fool’s Day joke on her. Sadly, it was no joke. I was four years old when my Pa died. I’m not sure I truly remember him, but I have been told so many stories and have seen so many pictures, that I think I do. He and my grandmother owned a bookstore called Books & Things, and my mother was the assistant manager. This meant I didn’t have to go to day care, instead, they just put me in a crib and tucked me under a desk! I guess it was inevitable that I developed a love for reading. And my Pa was always reading to me, or at least I’ve seen a couple pictures of him reading to me so I like to say he was “always” reading to me. One thing I do truly remember is that after he died, a big helicopter came to the house and took him away. Well, my mom told me that never did happen, but it’s what I have a memory of – perhaps, in my child’s mind, I saw him go to heaven on a great big helicopter? The city of Copperas Cove had a “Christmas in July” parade one year, Pa was Santa Claus and he dressed me up as his little elf and I got to be in the parade too. We were even in the newspaper. I have the clipping at home somewhere. Look at that picture – would it even be allowed these days to hold a baby on a float like that, with no seat belt, no car seat, nothing? I can’t imagine being picked to be in a parade now (much less actually wanting to be), guess it’s a good thing I got to be in one when I was a baby! Something else I remember – or have been told of – is the tree swing Pa made for me. The year after he died, pink evening primrose bloomed all around the tree. They bloom here towards the end of March or beginning of April (depending on how much rain we get) and whenever I see the first one, I imagine it’s my Pa saying hello! I never planted any at my house but they pop up in the yard every single year. Now that my grandmother has also passed on, my mother is left with the task of sorting her belongings. My grandma is a story for another day but she kept EVERYTHING and while that makes my mom’s task much harder, it also means she is finding some really cool things of my Pa’s. When he was in the Army, his official title was “Equipment Manager” but a huge part of his job was soccer coach to the Army soccer team. He (or my grandma) kept a ton of memorabilia, which we pored over and then donated to the Armed Forces Sports Office at Fort Sam Houston. They were so happy to get the scrapbooks and we know they have found the best home, where they can truly be appreciated! My mom has even gifted some of my Pa’s keepsakes to my husband, who has a great love for history. My husband now has my Pa’s old hat from 1954, we aren’t sure if it’s his Merchant Marines or Army hat, but it’s a keepsake and a really neat historical treasure! My husband also now has a ship’s bell, from the Arthur J. Tyrer which was a Liberty ship my Pa was stationed on from 1947-1948. My grandpa was originally interred in upstate New York, where he and my grandmother were from. My grandmother later transferred my Pa’s remains and he is now buried in the Killeen Memorial Park, where my grandparents settled after my Pa retired from the Army, and where I was born, and where my grandmother still lived until her death last year. My Pa was actually our 1st generation American family member and I actually just learned that earlier today, after calling my mother to ask what his middle initial “J.” stood for. His birth certificate states his official name as “Walter J. Schnack” with no mention of what the “J.” stands for. He was always called “Jake” but my mom thinks he was supposed to be a Jr., named after his father, Jochim Walter Schnack. But something must not have translated right. Even though I wasn’t old enough to know (and maybe not even truly remember) my Pa, I feel like I can at least know him through stories I’ve been told, and keepsakes we have kept over the years or found in recent years, and through some of the genealogical work my mother has been doing. I wish he had been in my life longer, but I have to remind myself he is still in my life, just in a different way. Want to write about your loved one on their Angel Day? Email Jocelyn Brown to share your story and get on our blog schedule! Easter with my girls has always been a colorful family affair. The Easter Bunny would come while I was out with the girls and hide baskets of goodies all over the house and yard. 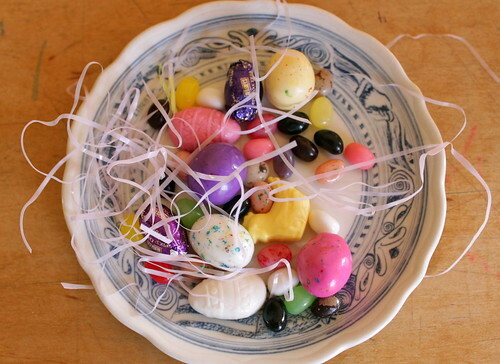 The day I discovered cascarones made for the best Easter hunts of all. 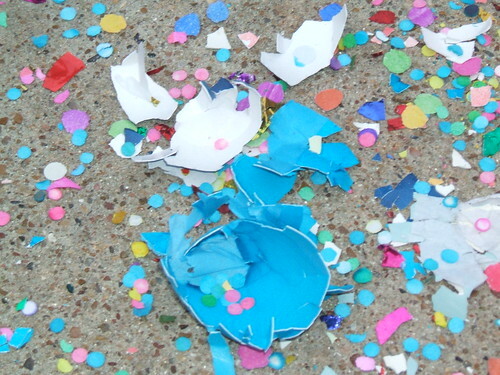 Those delicate shells filled with confetti of all colors makes such a lively scene; my husband seemed to think they made for a lot of vacuuming, but I think it was worth it. Now Easter is bittersweet. One of my daughter’s birthday is the end of March, making it close to the time that Annie died on April 5, 2010. Although it’s hard to continue the Easter hunt and dinner without Annie crashing the cascarones on our heads, it is a reminder to celebrate my children that are still here. This year, there will be three brand new grandchildren coming to Gran’s house for the Easter Bunny: 1-1/2-year-old Holden; his little sister, 4-month-old Harper; and their cousin, 6-month-old Perren. I ache for Annie to still be part of the festivities, but I must remember that she is. For me, that is what my faith gives me as a gift to make it through this time—Easter is resurrection. I will see Annie’s joy in my grandchildren’s eyes, my daughters’ laughter, and my husband’s love. What new traditions have you developed for the arrival of spring and all its meaning? What beliefs give you comfort? If it doesn’t feel that way yet, how will you take a step in that direction? I’ve learned that even one step in the right direction can change the entire journey. After working for several years as a Family Support Coordinator for Any Baby Can and EveryChild, Inc., Linda received a B.A. in Liberal Arts from UT-Austin and a M.A. Linda keeps her writing practice going as a blog, which she started on Annie’s birthday in 2010: www.phillips-write.typepad.com. She is currently working on several writing projects about her family, her girls, and her father.